Pure Style Home: Help save the Pink Silo!! 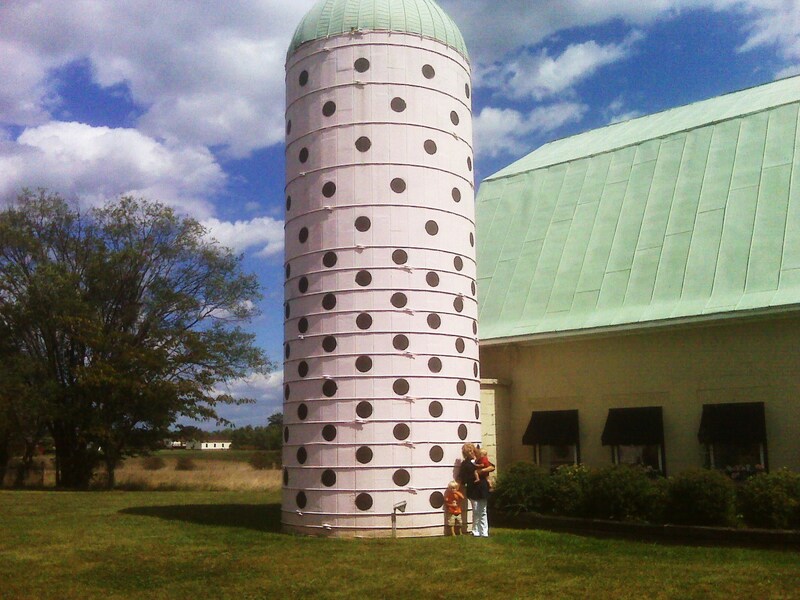 Help save the Pink Silo!! I seriously admire Donna: she's a determined, hardworking woman who's turned her dreams into a reality. Donna's been in business for over 5 years and has built On A Whim from the ground up. Donna donates a percentage of all sales to the National Breast Cancer Foundation and has already been forced to remove all of her pink breast cancer ribbons from the outside of her store. She's got a steel core & I know this won't keep her down, but she does need our help. She's supported me from the beginning when I was just starting out & I can't thank her enough. When you've signed your name, you will see a donation to the National Breast Cancer Foundation, and you do not have to donate in order to sign the petition. (You can just "X" out the page once you see that pop up but of course you can donate if you'd like to) Thank you so much. I signed it. Geez, don't people have better thingsw to do than compain about a piece of art. I am hoping those are brown polka dots. I think it is great. There was a person in Columbus, Ohio that painted her garage on one side, a beautiful sun flower garden. They made her paint over it. Not sure what happened as she said she wasn't going to. I signed the petition. Some people just need to get a life. It is obvious they have too much time on their hands. I just went and signed the petition and this is coming from someone who hates pink. But I feel that everyone is entitled to their own artistic rights and if Donna’s is pink then so be it. I can’t believe that’s a community where they don’t support breast cancer something that is killing women needlessly. Keep on fighting Donna! Let her have her polka dots...for Heavens sakes! And while we're at it...lets blast breast cancer out of this world! Craziness! Just signed it. Good luck to her. Lauren, have you posted this on facebook??? I'll link and if everyone does...there'll be lots more signatures!!! Congrats to Donna and good luck !!! I would pass this silo every summer on my way to camp. It was always a highlight of our drive and now a fond summer memory. I would be so sad to see it go. LOVE painted house's comment, hysterical! That is just ridiculous! I signed. I hope it helps!! This reminds me of a great little strip from my hometown. They too had to fight to keep the silo, it was going to be torn down. I will gladly assist this cause! SOOOO ABSURD!!!! I signed my name and gave my two cents. I hope she can keep it!!!!! Please update! How is this even harmful to ANYONE?! That makes me so mad! What is wrong with people? Glad you're helping to bring attention to her plight. Save the pink silo! That is just absurd! Why on earth does the county want to take away the artistic charm that makes these shops so eye-catching??? To me it's just another sign of the cookie-cutter suburban mentality that happens some places. The world's gone mad!! I can't understand why anyone would give two seconds to someone's complaint about the colour (pale pale pink!) of a silo. I really hope this complaint gets quashed. That's crazy! Well, San Francisco would welcome Donna, her store and pink silo any day of the week! I signed the petition....isn't it funny what people find to worry about. I think it has lots of charm! BTW, I've got a great giveaway going on if you want to stop by. Oh my goodness you are not going to believe this but I am sitting her in Houston TX typing on my laptop at a darling antique desk that I bought at that very store! I LOVE that place!!!! I will sign the petition!!!! What a small world!